We can live large without living with a lot of stuff. At least that’s what Jamie Mackay, founder of Wheelhaus, Inc, thinks. Here’s the thing—he’s not alone. There’s a real “live small but don’t sacrifice luxury” movement afoot and Mackay and his high-end mobile Wheelhaus cabins are at the front of the pack. For good reason too. Born and raised in Jackson Hole, Mackay grew up skiing and fishing. His dad ski patrolled in the winter and built log and timber-frame homes in the summer. Jamie was a regular visitor to the construction sites, and he paid attention. He learned early on the value of good craftsmanship and developed a healthy obsession with design and architecture. All this while still fishing every chance he could get. After college Mackay returned to Jackson because “the gravitational pull of Jackson is just too strong to fight.” And in a small town like Jackson, you have to get creative if you harbor an entrepreneurial spirit, so Mackay set out to make something happen. He bought an old KOA campground and tried to get an affordable housing project approved by the necessary city channels. When that didn’t work out, Mackay didn’t get discouraged, he adapted. 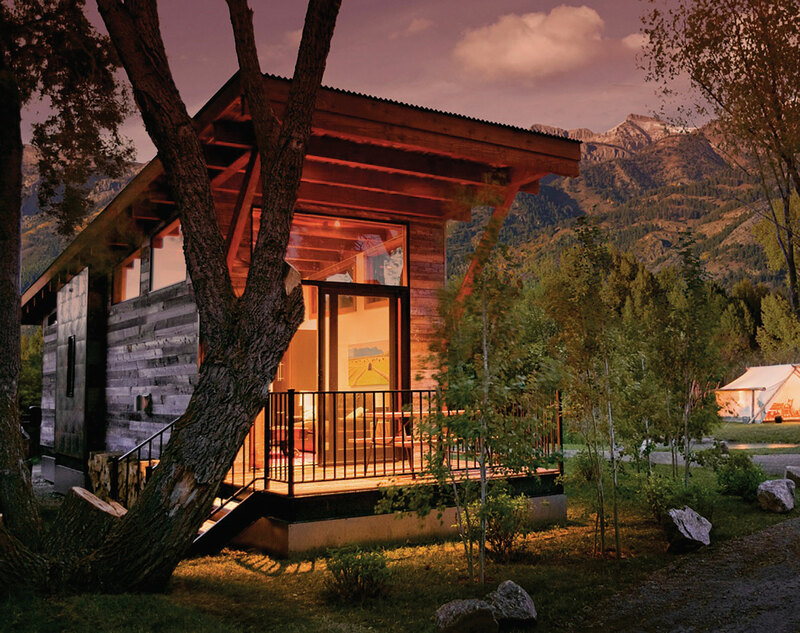 So he took matters into his own hands—literally—and he started building the first Wheelhaus, a model he called the Caboose, and he built it onsite at his soon-to-be Fireside Resort. After that first Caboose, there was a model called The Wedge. 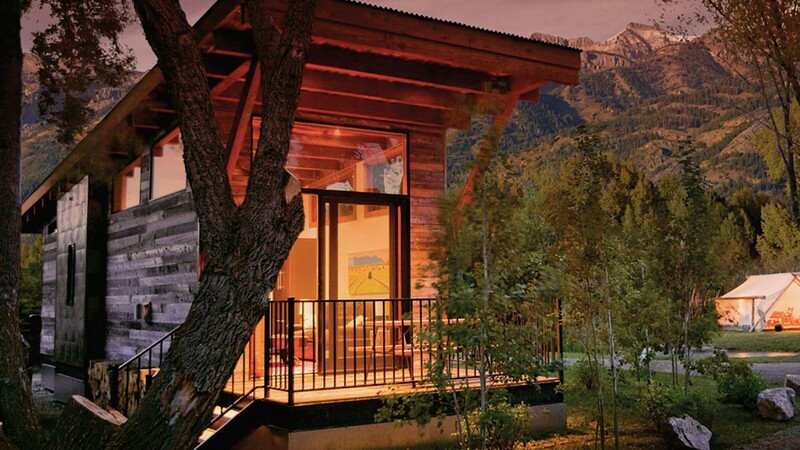 And then his Fireside Resort in Jackson Hole started getting busy. He built his own pre-fab field of dreams and people came to stay. “We probably tore down the interior walls on that first Caboose three or four times to get three inches here or five inches there. We’re working with limited square footage so we were meticulous and creative.” What, you might ask, is the square footage we’re talking about? Well, the Caboose model is 400-square-feet of indoor living space. There are some storage add-ons you can opt for so that all your outdoor gear and your toys have happy homes, but most of the Wheelhaus models range from 350 to 400 square feet. There is one deluxe model, the Hitch Haus, aptly named because it stitches together three smaller models for around 1,500 square feet of luxury living. But that was not the end of Mackay’s ingenuity—it was only the beginning. Mackay’s guests started asking if they could get a mobile unit like the cabins at Fireside. Ever the enterprising businessman, Jamie responded, “Of course you can.” Orders were placed. Hands were shaken, and then Wheelhaus Inc. proper was born. In all, he and his friend and co-worker Rick Gava have designed seven models with an eighth on the way—the Caboose, Wedge, Hitch House, Rail Car, The Mod Haus, Silo, and the coming-soon, the totally-off-the-grid Flex Haus. Whatever your speed or particular station in life, Wheelhaus is all about living large in small spaces.